Preheat broiler. Place poblano peppers on a baking sheet and put into oven. Broil until skin starts to blister and char, around 3 minutes per side. When peppers are roasted remove pan from oven and place peppers in paper bag. Let peppers sit in closed paper bag for 10 minutes. Remove peppers from bag and remove skin, seeds and stem. Chop peppers. Turn the broiler off and set the oven to 350 F.
Spray 9 X 9, or other desired casserole dish, generously with non-stick cooking spray. Set aside. Combine milk, eggs, butter, and creamed corn in a large bowl. Mix until blended. Add dry ingredients (flour through salt). 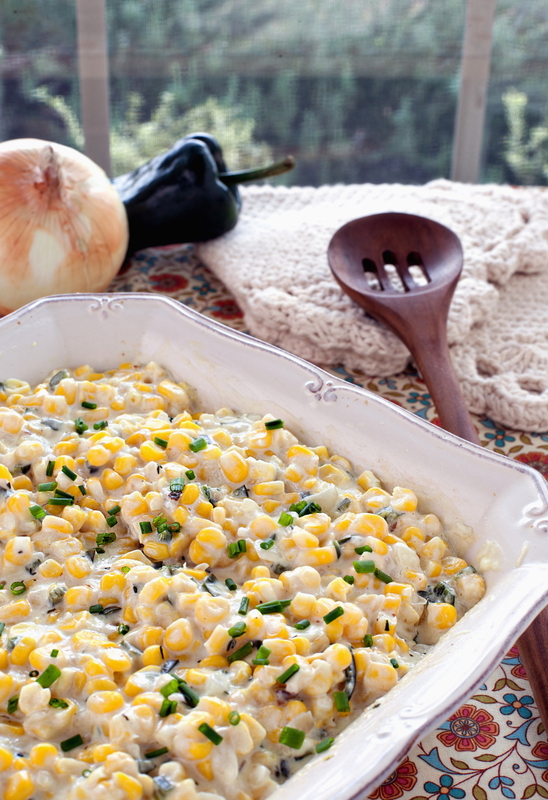 Fold in chopped poblano peppers, frozen corn, and cheese. Spread the batter into the prepared pan. Bake at 350F for 45-55 minutes or until knife inserted into the middle comes out clean.